We are always looking to improve the facilities provided at Tullynessle Hall and currently we have a project underway to install permanently the audio-visual (film presentation) equipment, link it to the hearing loop and create a fully integrated presentation/PA system. To finance the project, we have raised funds through various activities, received donations and successfully applied for grants. One of the successful grant applications was to ‘Tesco - Bags of Help’ – the funding system operated by Tesco whereby shoppers at a selected local store (in our case – Inverurie) vote for one of three selected projects by placing a token, received at the checkout, in the appropriate box. Although our project has been selected, and thus guaranteed some funding, we need to try to win the most votes in order to get all the funds we applied for. Voting will take place throughout May and June. PLEASE SUPPORT THE HALL! - SHOP AT TESCO, INVERURIE AS MANY TIMES AS YOU CAN DURING MAY AND JUNE. MAKE SURE YOU PICK UP A TOKEN AT THE CHECKOUT AND PLACE IT IN OUR PROJECT BOX! ……THANK YOU! (Please – only take one token at a time at the checkout, and only use tokens received at the Inverurie store during May and June. Failure to follow these rules could get our application disqualified – and we wouldn’t want that!). Many thanks for your help. The purpose of this site is to provide the local community with a source of information concerning events in the community in general and in the hall in particular. 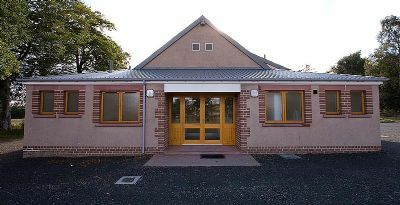 It is also to show people what facilities the hall offers and how to make contact for more information or make a booking. Tullynessle and Forbes Hall Association would like to thank all those who have helped to make our refurbishment possible and acknowledges in particular grant sponsorship from our major sponsor - Big Lottery.